METROPOLIS MEDIA is a full service Marketing and Event Production agency offering our partners individual service from concept and ideation through complete event production, execution, management and results analysis. METROPOLIS MEDIA is a full service publicity firm representing clients in a broad range of industries from alternative health, computer-related products, music and books to finance, politics and general busines We tailor each fully-integrated program specifically to our client’s objectives and desired results. We leverage our partners sponsorship strategies through innovative operations, promotions, merchandising, consumer incentives, and media extensions. We have years of experience in implementing unique and highly successful promotional programs associated with events and their respective industries. It is this experience, combined with a tremendous passion for what we do, that has formed the foundation of the company’s excellent reputation. We as an event management & advertising company in India collaborate with our clients to deliver more than interesting theoretical solutions, we provide real answers to real problems. We work with you until the very end of a project to ensure that you get what you need and we are there for ongoing support too.By understanding the needs of our client’s and customizing our solutions based on their objectives, our outdoor advertising serve our clients effectively, efficiently and economically. As our clients’ needs have changed, we’ve changed too, adding technologies and services that allow us to provide a full range of integrated communication solutions. We are a fully integrated event management company, having best in the class capabilities in the area of advertising, media planning/buying, direct marketing, promotions and public relations. In a business where profit margins are unpredictable as well as inordinately high, we are transparent in all our dealings and our services are reasonably priced. Directors having years of experience. Trained personnel to handle field work. We have, over the years, well understood the need for creativity and innovation in events. Be it a launch, a seminar invitee, or an agenda for a residential conference, our in-house design and creative team will be able to come up with ideas which will ensure that the event has a lasting impact. The creative team can ideate concepts, create identity, launch campaigns and give the events a life of their own. We conceptualize and execute an event in such a way that it reinforces the image of products and services. We Provide integrated solutions to create multiplying effect and achieving overall economics of operations. We integrate cutting edge creative solutions to enhance value and response amongst target audience. 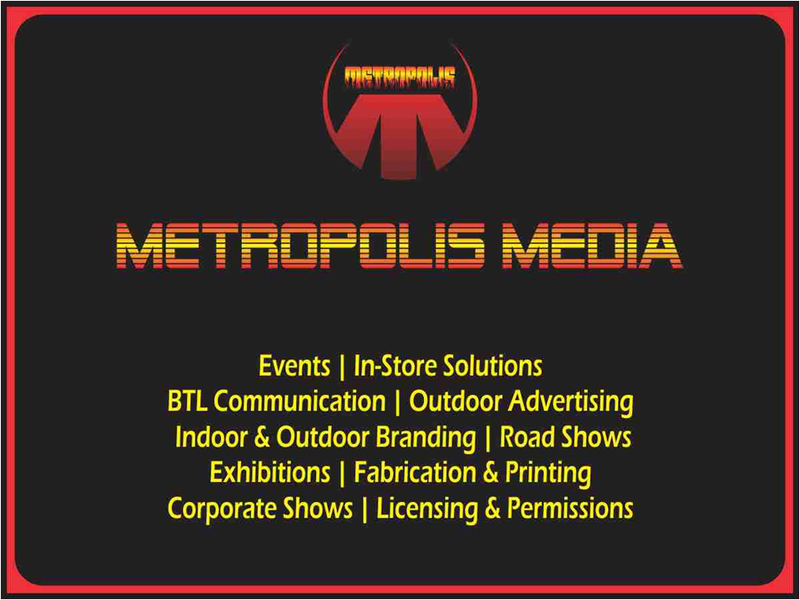 METROPOLIS MEDIA works as an extension of your Corporate Management and Marketing Team.